Gargoyles work hard to protect a building by directing rainwater from the roof to the drains. Without gargoyles, water would roll down the walls and damage the stones. In time the building would collapse. The word ‘gargoyle’ comes from the French “gargouille” from which we also get the words “gargle” and “gurgle. Gargoyles became popular in the Middle Ages when the great European cathedrals were built. Thanks to the gargoyles, these churches are still standing. Washington Memorial Chapel has nine guardian gargoyles that gargle and gurgle. Four gargoyles keep rainwater off the south wall. Three work on the north wall. The last two are working alongside the north wall; one faces east, the other looks west. Each of our gargoyles is distinctive, hardworking, and almost 100 years old. To honor their century of service Fr. Krueger thought it would be great if we named them. 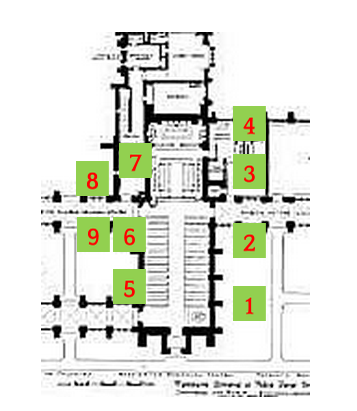 A sketch of our gargoyles and their position on the Chapel’s roof is provided along with a photo of each. Walk around the Chapel and meet our guardians. Then, pick an Anglo-Saxon name that you think captures the gargoyle’s character. (The Internet can help you find these names. Google: “Anglo-Saxon names and their meaning.” If you are younger, ask your parents to help you.) Fill in the names you selected for each of the nine gargoyles along with the meaning of each name on the attached form and place it in the box at the back of the Chapel no later than October 25. All submissions will be reviewed and the Parish Life Committee will announce the results on our Chapel website shortly thereafter. We will celebrate their naming at the Annual Congregational Meeting, November 15th and then create an illustrated pamphlet as well as a YouTube Video so friends of the Chapel can meet our hardworking guardians.